What a weekend! Otherwise known as this is why my blog isn’t up until Monday morning. I flew into Baltimore, Maryland on Friday evening and had the pleasure of speaking and cooking from PURE DELICIOUS at the Baltimore Book Fair on Saturday afternoon. I always love being able to share my story in hopes that it will help someone else, and it’s always a treat getting to feed others. I made the Roasted Tomato and Corn Risotto with Basil Arugula Pesto and Brussels Sprouts with Red Onion, Bacon and Avocado– even the skeptics found themselves licking their forks clean! And there is nothing like watching people make connections on what is going on with their health and what they are eating after hearing what our process was like- it’s truly awesome to be a part of. Then Saturday late afternoon I headed to Amtrak, and took the train!! I think I am a quite a fan of the train actually- there was a peaceful nap involved and some reading and the whole trip up to New York took just shy of 3 hours and was far more relaxing than flying. And then Pete got off of a flight an hour later and we got to spend the rest of the weekend together. With No Kids. In New York. Amen. If you follow me on instagram and watch my insta-stories then you know we had brunch at Seymours (SO GOOD) walked a ton and then realized that we couldn’t watch our beloved Seahawks from the hotel, so we took the Subway waaay up to the Upper East Side where lo and behold there is a Seahawks Bar called Carlow East. #NYCEAHAWKS- packed to the brim with 12’s (we were the ONLY ones not dressed in jerseys!) and it was the funnest thing ever. Besides the fact the Seahawks slaughtered the 49ers, I realized that it is way more fun to watch the bar with a bunch of Seattle/NYC transplants in New York with a bottle of Jameson. If you are a Seahawks fan and wind up in New York on a Sunday during football season- this is NOT to be missed. That was the most fun I have had on a Sunday in I don’t know how long. And then thank goodness I went and ate a steak the size of my head and a bucket of French fries to soak up my “too fun” afternoon and went to bed early. I mean I have a lot to do today and I also have to be ready to watch this debate tonight, right?!!! I am sure every other person in America is ready too- if you are not already just planning to make popcorn and open a bottle of wine for that show, then maybe plan to make a fast and delicious dinner first?! 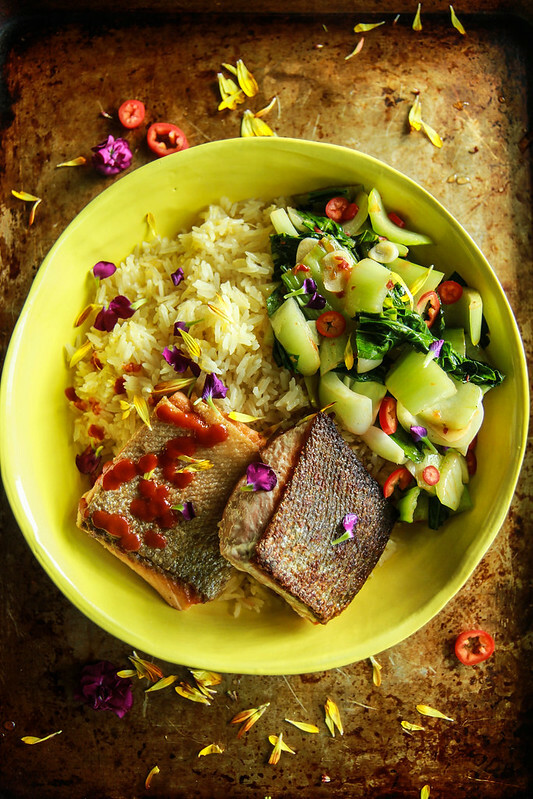 Like this Pan Fried Salmon with Crispy Ginger Rice and Spicy Bok Choy. I have to tell you by the way that Crispy Ginger Rice is a thing and is probably my new favorite way to eat rice. The ginger that fries in the coconut oil creates a nice crust on the bottom of the pan so that you have a crispy texture (like with paella) to that part of the rice- SO GOOD. Addictively good. Look for me using this recipe as a compliment to other dishes soon. But as a base for pan fried salmon (with that crispy skin!! Yum!!) and fresh and spicy bok choy? You have a got a really delicious restaurant quality dinner in about 20 minutes- pretty hard to beat! Start by making the rice. In a saucepan melt the coconut oil over medium heat. Add the ginger and sauté lightly stirring often for about 30 seconds, the ginger will start to stick to the pan. Immediately add the rice and stir, coating the rice in the coconut oil and frying it until the rice is partially transparent and well coated. Then add the chicken broth and the salt and bring the broth to a simmer. Place a lid on the pan and turn the heat to lowest. Simmer covered for 15 minutes and then turn the heat off (but leave on the stove with the lid on) until you are ready to serve the rice. For the salmon you will need a heavy pan (I used a cast iron skillet.) Sprinkle the salmon with kosher salt. Let the pan get really hot over medium-high heat, almost to the point of smoking and then melt the coconut oil in the pan and add the fish, skin side down. Let the skin sear and get really crispy while also cooking the salmon through past the half way point (you will be able to see from the side on the piece of salmon). Then flip the salmon and continue the cooking through. This should take about 6 minutes total, but if you have a thinner piece, knock a minute off of that. Set the salmon aside to rest for a minute. 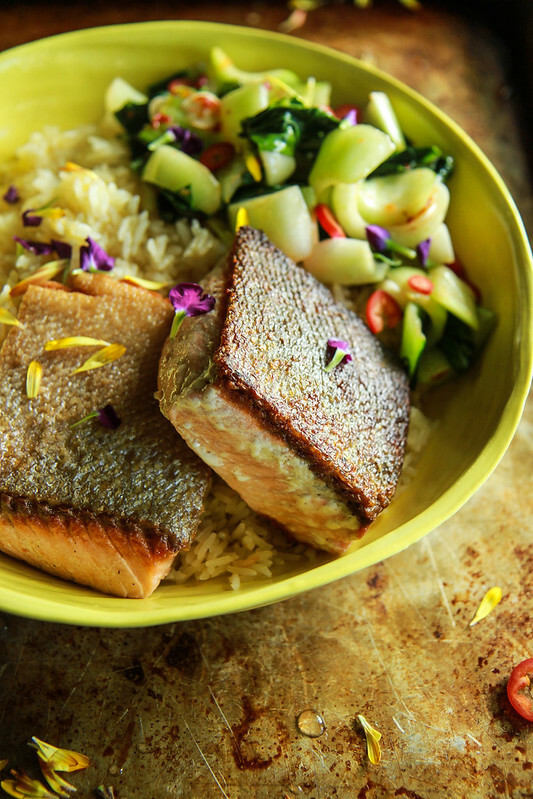 Use the same pan, with the salmon drippings and add the sesame oil over high heat. Drop the garlic and chili slices in and let them turn golden, about 15-30 seconds, then add the sambal and the bokchoy. Toss the bok choy, letting it cook until just tender and wilted, 1-2 minutes. Season to taste with kosher salt. Another gorgeous dinner recipe! Love these flavors! Totally making this gorgeous recipe! What a beautiful meal with so many great flavors! What a nice meal! 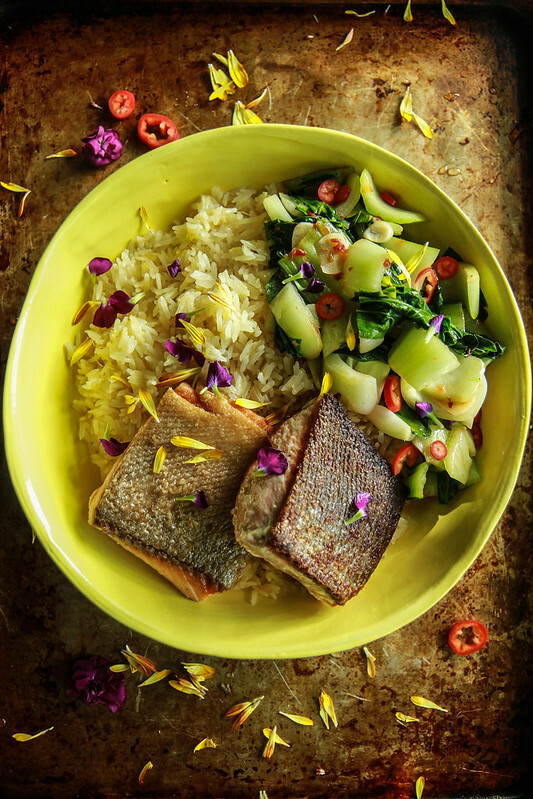 Love simple pan fried salmon with that crispy skin! A nice and visually elegant dish. All with flavors I like. Luv the visuals of it. It will surely be on my cooking menu soon. I’m craving that perfectly crispy skin! YUM! I love all the delicious flavors in this dish! This is one gorgeous & tasty dish! Looking forward to making this soon! Has anyone made the crispy ginger rice? I want to make it tonight, but the amount of chicken broth seems too little for the amount of rice. I am tempted to use the usual amount of liquid to cook sauteed rice. So glad that it wound up working out Susan!